Firegear is your single source for fire pit accessories, starting with plug and play drop-in fire pit burner systems. 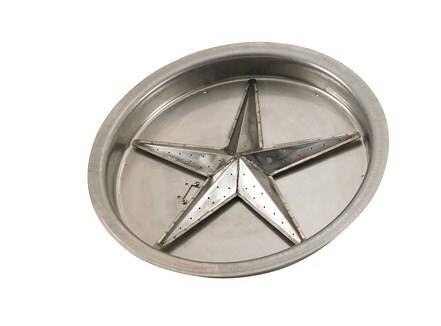 Our Round fire pit kits feature 304 Stainless Steel burner pan and firestar™. Our round fire pit burner systems features complete packages for natural gas and easy to covert kits for Liquid Propane with multiple choices of ignition systems. Kit Includes Round Pan with appropriate sized firestar™, American Flame Direct Spark Ignition system (Battery Operated)with On/High/Off/Low Remote Control included. Kit features stainless steel igniter protective shield, Traquiline SS gas flex line from valve system. Installer will finish by attaching hard pipe (not included) from key valve to gas source. 5 year limited warranty on all stainless steel parts (residential), 1 year commercial.